What words and phrases have dealers used to describe this event? What is the National Automotive Insider Event? The National Automotive Insider Sale is a copy written and trademarked campaign that drives pure in the market buyers to your dealership. 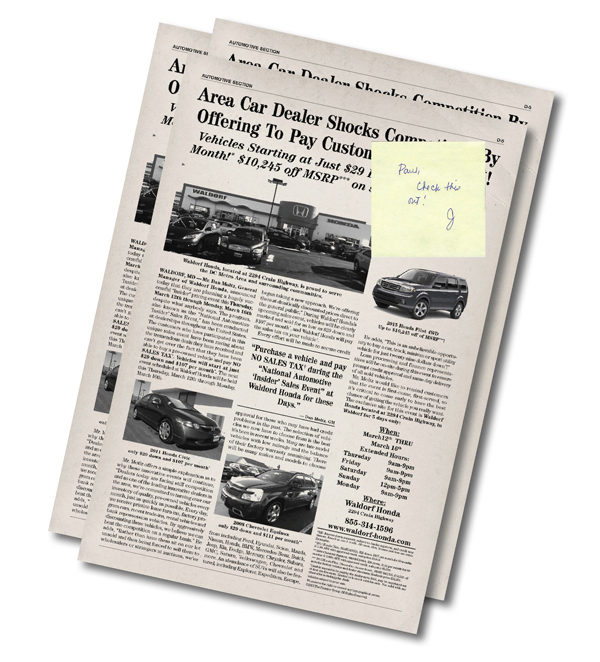 You choose a sale date weekend and a newspaper article as the mailer, we get the mail ordered and shipped to your dealership before the sale. You take the handwritten mailers that come with live first class stamps to your local post office so the mail looks as though it originated from your area. It will reach mailboxes in one to two days, then you get scrambling to handle all the customers showing up to buy cars off your lot based on a monthly payment! successful Campaigns to date generating $100,000 or more in gross profits for just one campaign in just 3 days. Proven to be the most cost effective form of marketing in the Automotive industry. Choose from over 50 articles for your new or used inventory. Run the same article in your local newspaper for added response rates. Co-op approved articles available for most manufacturers. Articles will be customized to your dealership. Why is this any different from other Direct Mail Campaigns? No need for any Gifts or Gimmicks, just PURE BUYERS. Is my dealership right for an “Insider” sale? Absolutely! The “Insider” event is right for any size dealership, large or small, and will produce outstanding results over 3 days or more period, usually allowing a dealer to salvage the month in a single weekend. How soon can I book an “Insider” campaign? Your dealership should allow TPG 3 weeks to put together the “Insider” event. Call 1-800-618-3688 today to schedule an event that’s GUARANTEED to boost sales and profits for your dealership.